Fear not, you don’t need to get the garlic out; it was Jed, our driver from SIG Roofing Huddersfield. He managed to raise an amazing £400 for Kirkwood Hospice in Huddersfield, which is a cause close to the hearts of all the staff within the branch. It was in collaboration with the local radio station in West Yorkshire, Pulse 1, who had set up the charity appeal for the hospice. 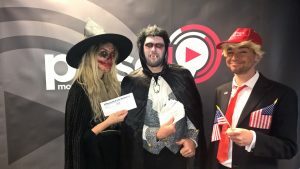 Jed swept his way over to the station where he let the listeners know of his success and met with the presenters, Danny Mylo and Rosie Maddison, who were also dressed up. Jed was thrilled with how much he had raised and the generosity of everyone who donated ‘Everyone’s support was great and it turned some heads when I was out delivering! I also popped into the local shop on my way home which was quite amusing’ he went onto add ‘it was great to meet the presenters of the show and it was lots of fun raising money for a cause that is so important to us all’.